A Trikuta (Having Three Sanctum Sanctorum) Hoysala temple tucked inside the KR Pet taluk of Karnataka,the Lakshminarayana Temple at Hosaholalu. This is one of the best places to see the late Hoysala architecture in total peace without any hustle and bustle of the crowds and tourists.The atmosphere is very peaceful and helps in studying the temple and its art.Here the Central Vimana (Tower) having greatest emphasis.Built by Hoysala Ruler Veera Someswara around 1250 AD, this is one of the temples built in the southern regions of the empire during 13th Century as there was a constant fear of invasion on the northern front of the Hoysala empire and Veera Someswara was giving more attention to the politics of Tamil Land. The Main Deity is having Shankam (Conch) on right hand and Chakra (Discus) on the Left hand which is a rarity.The Original Venugopala idol in one of the sanctum was reported missing in 1935 and a new idol which is different to the original idol has been installed by the authorities. Built in 13th Century, the temple can be termed as par excellence when it comes late Hoysala architecture. The only contemporary temple which can be termed to be equal in terms of beauty and excellence is Somnathpur and Haranahalli Temple in my view. The only black spot on this Shinning Sun is the Absurd Porch added in the front during the 17th Century which has eclipsed the original entrance and the lintel. This has also resulted in blockage to the outer prakarams. One have to climb from the side to relish. As Always I would let the photographs speak for themselves. As Always your feedback is highly solicited ! Such beautiful sculpted works. Thanks for showing us. Gorgeous. 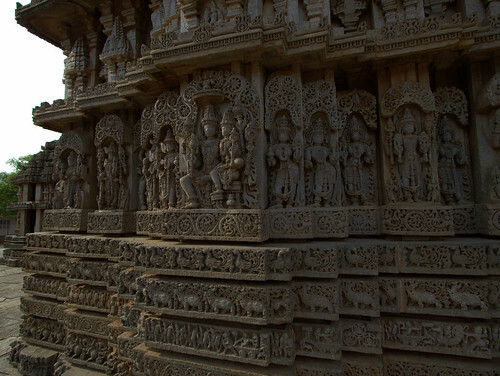 The intricacy of Hoysalas on soapstone is always astounding. Why are two panels golden yellow in color? Is it sunlight or the natural color of the stone? I would think black soapstone would not appear yellow even in sunlight. 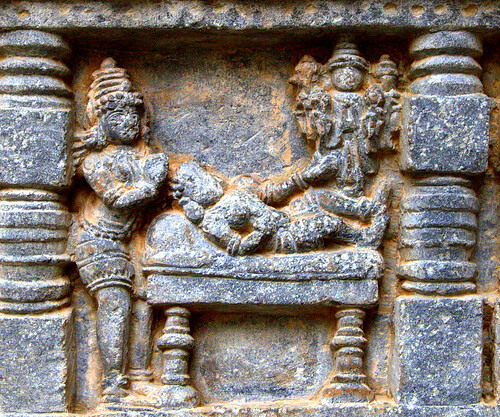 Soapstone which was used by Hoysala is a special stone and is not black as Granite. One of the features of soapstone is that it portrays different shades during different parts of the days. Yes the sunlight falling on the panels do give it a golden look..
You should see it in person to believe it..
No doubt it is a beautiful Hoysala temple, but a large number of figures on the outer walls are damaged or defaced. glad to note your interest in Karnataka temples. Have you visited Upparapete in Chintamani taluk? Have you had occasion to see a Chetteasvaram temple there? I read an inscription about that temple and it sounded great. 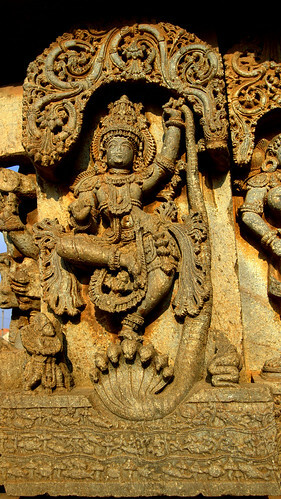 Kalinga nardhana sculpture is beautiful and your photographing skills have highlighted its nuances in the best possible way! hats off!